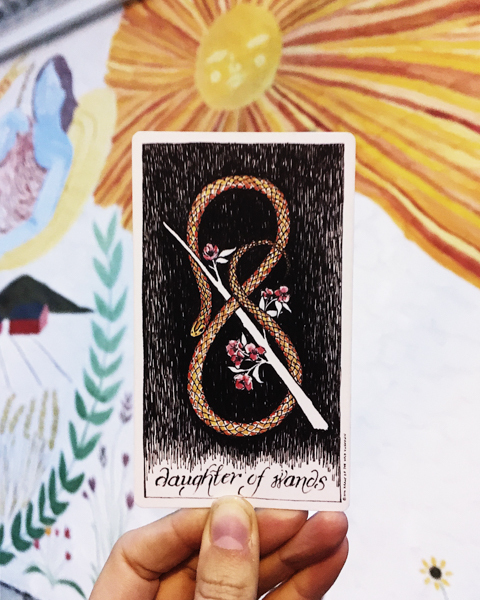 The Daughter of Wands is the freshest form of fire. It is the candle flickering in the morning light. The embers floating in the air cast by the stream of your breath into your sage smudgestick as you clear away the energy. The heat you create between your palms, fast friction fighting off the early fall frigidity. Swift and slow, a pace and a change, a call to conclude and a cry to commence. Fire is about movement and these shifts are indiscriminatory. This week serves up a solid set of squares that are not entirely straight. Squares create blocks and tension and this happens to be a series of stop-and-go’s that stroke our most sensitive skins. This week wants us to struggle and to shine. It suggests a structure that is predisposed to revision and revamping if we are willing to move a little this way and that. Try to cast a spell of everlasting transition and support yourself with the conviction that moving 3 millimeters is moving somewhere. The Daughter is here to motivate and inspirit us when we feel stuck between a rock and a stone. She reinforces that there is always space for a pebble to wedge its way in. Tell a little girl she can’t move and she’ll find a way to wriggle through. A small but insightful creature, she reinforces that the loudest biggest voice isn’t necessarily the strongest or the rightest. She is unafraid because she can’t break a rule she didn’t know was there. This week might leave you frustrated with your frameworks, stagnated by structure, and pissed off in a powerplay. Put a little twerk in your work. A fence is an invitation. It’s up to you whether you want to climb or to start digging.